The ATA-27 automated arrayer is designed for making construction of high-density tissue microarray blocks fast, accurate and reliable. Automated arrayer ATA-27 is intended for laboratories requiring higher throughput in array production. It eliminates the tedious manual punching procedure from array construction workflow. After planning and designing the array layout using dedicated software, ATA-27 creates array blocks automatically using robotics to measure block heights, retrieve donor tissue cores, create holes in paraffin matrix and deposit tissue cores into holes. The instrument can accommodate nearly all current tissue cassettes and can be easily adapted to array large or odd-shaped archival specimens. The ATA-27 accepts a full range of punch sizes from 0.6 mm to 3 mm and can produce up to 26 replicate array blocks in a single run. 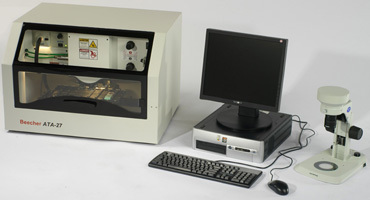 The system comes equipped with high-performance PC pre-loaded with custom software for mapping donor cores to a single or multiple recipient cassettes. Advanced options allow the user full control over many of the process variables that optimize the successful creation of recipients given a large diversity of donor tissue characteristics. Once programmed, the ATA-27 needs no user interaction to create an array. The instrument is equipped with a 110/220 volt power supply and easily fits on a laboratory bench. Base pricing for the ATA-27 includes delivery, setup and one day of individualized training at the user's laboratory (US only - available outside the US for an additional fee) and one year of technical and warranty support. The ATA27 system features a special 'backfill' option that is particularly useful for creating arrays from very small tissue blocks, and for making as many replicate arrays as possible. When the ATA27 punches a core from the donor block, it leaves a hole in the block. The backfill procedure fills the hole in the donor tissue block with paraffin. This prevents the donor block from collapsing when very many adjacent samples are punched out of the donor during array construction. Even overlapping cores can be retrieved, resulting in maximum utilization of the representative areas in donor blocks.